I ain’t dead! An American once scolded me for using “ain’t”, actually. The cheek of it. I had actually hoped to update this blog a couple of weeks ago, before it became a whole month since the last update, but I failed. Fortunately, that’s about the only thing that I’ve failed in recent history, so I guess that’s OK. Actually, I failed my 365 photography project — well, I failed to complete it. The undertaking itself was far from a failure: I learnt a lot about how to take photos of humans, and that was really all I was after. Things have been going very well over the last few months. I think my last “life update” was back in April, when I wrote about being fired by AOL, and then hired by Ziff Davis. I was swiftly ferried to New York to meet my new bosses and colleagues, and I think I was well received. It’s hard to say — I have almost zero experience in the workplace, having only spent two weeks in an office when I was 16 — but I got the feeling that I would make a welcome long-term addition to the office, if I should decide to stay a little longer next time. My main concern, though, was whether I would be able to convince my bosses that I was worth the money they’d paid for me. I was incredibly self-conscious of the fact that they were flying me out and housing me at a boutique hotel at great expense, too — I wouldn’t have minded so much if I’d had a chance to prove my worth or something, but they’d only just hired me! Fortunately, all my worries were for naught. They liked me — or I think they did, anyway. I’m still not entirely sure that I’m worth such lavish treatment– but perhaps that’s my innate British self-effacing diffidence, eh? 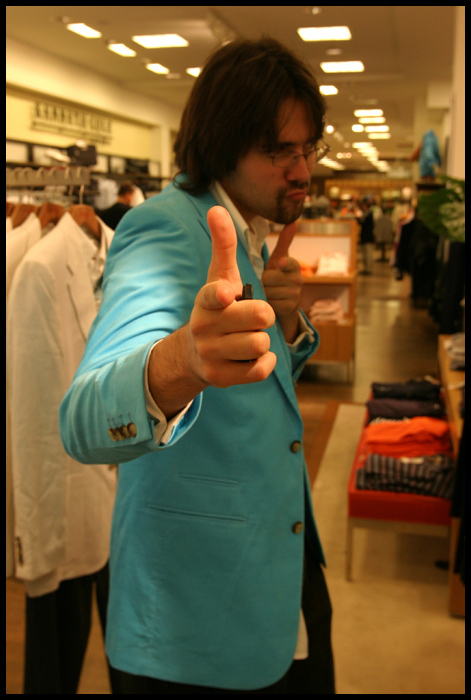 While in New York, beyond watching Memphis (a far cry from the 5-musicals-in-4-days that I managed in 2005 — this is what I looked like in 2005, by the way), I also visited the Museum of Modern Art. I didn’t do a whole lot else except eat good food. I had my first ever ‘barbecue’ meal at Hill Country — and also my first ever piece of brisket! Frickin’ orgasmic — where I sat on long benches with my immediate boss, COO and CEO, and ate greasy lumps of delicious meat with our bare paws. American CEOs are different from their stiff and starched British cousins, seemingly. I had my first real Mexican meal, too, at Toloache in the Theatre District. I started with a huge bowl of guacamole, served with a basket of fresh-fried tortilla chips, and followed up with the finest quesadilla I’ve ever tasted. It had black truffle sauce, or something silly like that, and the tastiest beans ever. Words can’t describe how good those fresh tortilla chips were. I also ate at Lombardi’s, America’s first ever pizzeria. We shared a normal pizza and a ‘white pizza’ (another first for me); both were nice, but incomparable to some of the pizzas I ate in Italy. I also bought a MacBook Pro from the flagship Fifth Avenue Apple Store. This is my very first Apple, Mac OS-powered computer. I like the trackpad gestures, but that’s about it so far; it hasn’t blown my mind. I also recently bought an iPad 2, just to see what the fuss is about. So far my mother has used it more than me. When it’s in my room, it just sits there, limp, lifeless and slowly discharging. I do have plans to get away from my computers more in the coming months — but to be honest, if I’m away from my computers, I’d rather spend as much time as possible not looking at yet another back-lit screen. The jury’s out on the iPad, then. You’ve already seen a few photos from New York, but be sure to hit up the full gallery on Flickr, which has photos from all of my trips to the US. The first picture almost looks like a scene from Alfred Hitchcock’s “The Birds”! 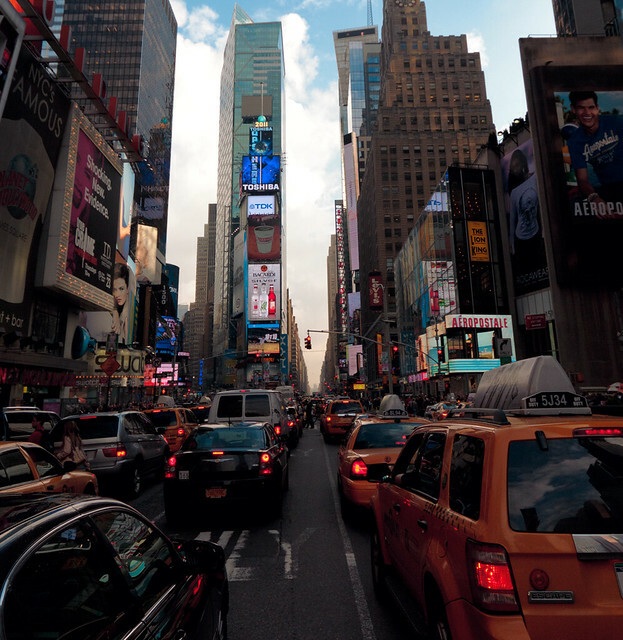 I really would like to visit New York!!!! I love Broadway. You don’t like your Mac? 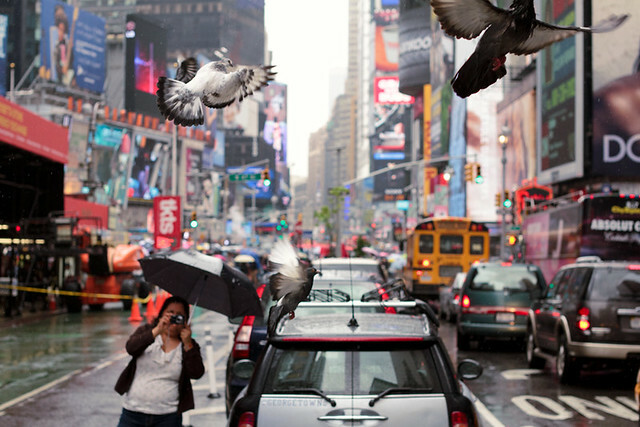 I love the first picture, the birds, the lady taking your picture (?) but it’s beautiful :). Yeah I have failed my 365 project too…but I will keep going!! Ahh you got a Mac and iPad… jealous! I want an iPad but not a necessity I hope you at least get to blog now and then with photos of course! I just wished I’d asked the lady to email me a copy of the photo I bet it would be an amazing photo… Oh well. I guess she’ll show it to her family… and maybe it will find its way back to me when I’m older.